Heavy-Duty Ring and Spade Terminals are available 2- or 3-up on single-reel, rear-feed system, which allows 2 or 3 terminals to be crimped onto ground wire at one time for high-voltage applications. Made from solid, smooth-finish brass, terminals are offered in sizes to crimp onto larger, higher voltage, 6-8 and 8-12 American Wire Gauge ground wire from single large-capacity rear-feed reels. New system eliminates time-consuming handling of bulk ring and spade terminals, or need for separate reel feeding systems limited to one-up crimping. Heyco perfects space-saving, time-saving single-reel rear-feed technology; allows two or three heavy-duty ring and spade terminals at a time to be crimped onto ground wire for high-voltage applications. New Product: Heavy-Duty Ring & Spade Terminals, available two or three up on a single-reel rear-feed system. Design: Heyco Products In-House Product Design & Engineering Team. Product Applications: High-end commercial-grade major appliances, such as dryers, freezers, large-scale food mixers, ranges and washers. Mobile equipment such as golf carts, maintenance vehicles, RVs and snowmobiles. Battery Chargers and any high-voltage electrical current generating or carrying device. Product Description: Heyco Heavy-Duty Ring & Spade Terminals are jewel-like in their precision. Highly engineered oval or fork-shaped conductors are made in the USA, in Heyco's own state-of-the-art plants from our own dies, using skilled labor and modern CNC machine tools. Their only equal is Heyco's line of lightweight, padded Range & Dryer Blades. Made from solid smooth-finish brass for maximum conductivity, the real beauty of Heyco's Heavy-Duty Ring & Spade Terminals is evident when they are installed in product sub-assembly and manufacturing operations. Heyco furnishes its Terminals in the sizes required, to crimp onto larger, higher voltage 6 to 8 and 8 to 12 American Wire Gauge ground wire, from single large-capacity rear-feed reels. No loose pieces. No multiple reels. No interference with assembly operators or dangerous overlap onto tight floor space. Heyco reels can be custom-configured for two- or three-up crimping in a single-step, continuous-flow high-throughput operation. There is no twisting of rings and spades from the reel and no wasted components. As the Terminals mount onto OEM end products, time and productivity savings mount in lockstep. Ordering Information: Literature, specifications and pricing for Heyco Heavy-Duty Ring & Spade Terminals, electrical conduit and fittings for a broad array of applications, is available from Heyco Products Inc., 1800 Industrial Way North, Toms River, NJ 08754. Telephone: (800) 526-4182. Fax: (800) 358-7904. 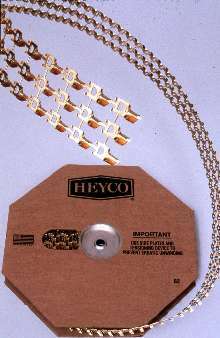 Visit Heyco Products on the World Wide Web at: www.heyco.com. Heyco Products, Inc. is certified to ISO 9001 quality standards and is the specifier's first name in wire protection systems worldwide.